After a long, hairy month of growing handlebars and mutton chops and raising funds and awareness for men's health, raise a pint with your fellow mustached brothers and sisters of Venice and partake in some well-deserved Movember merriment at the first Stouts N Staches bar crawl this Saturday, November 23, from 2 to 8 p.m.
Festivities begin at the Hotel Erwin beer garden with craft beer specials, free shaves from Floyd's 99 Barbershop, a photo booth, mustache contest and live music from Mind the Gap and Jack of Hearts, a Bob Dylan tribute band. 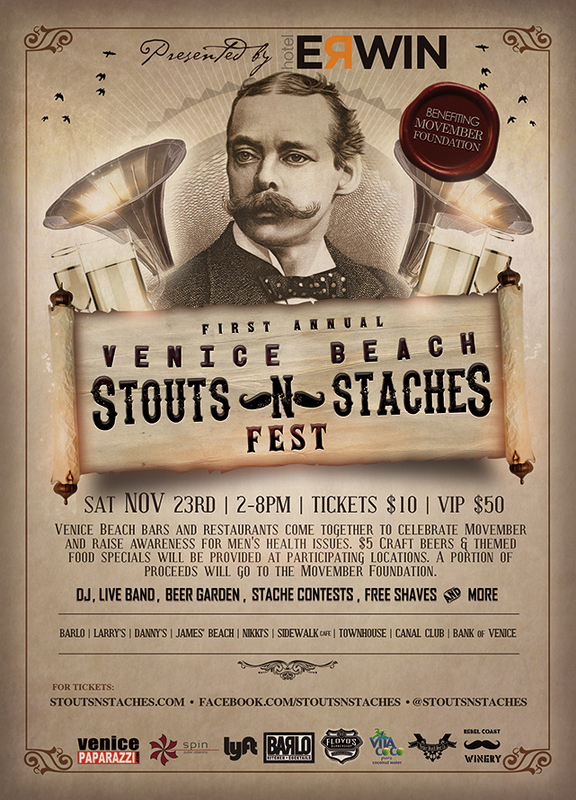 Bank of Venice, Townhouse, Larry's, Danny's, The Sidewalk Cafe, Canal Club and James' Beach will all be serving up drink and food specials for those with a Stouts N Staches wristband -- $10 in advance and $15 the day of the event -- with a portion of the proceeds benefitting Movember. VIP passes are also available for $50 and include all-you-can-drink craft beers from Goose Island and Venice Beach Brewing Company, wines from Mustache Wines and Rebel Coast Winery, and access to High Rooftop's Stache Lounge with free haircuts from Floyd's and man-icures. "All attendees who flash their real stache at the check-in, are automatically entered to win a special Hotel Erwin prize package valued at over $500," according to Stouts N Staches.